The Revenge of Shinobi- You walk from left to right, you slash at cookie-cutter enemies, and you keep doing that until you're finished. 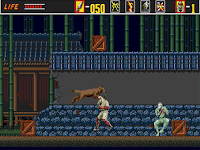 Sega's Master System, Genesis, and Game Gear platforms played host to five different games in the Shinobi series. 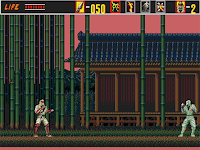 Besides the abundant presence of ninjas in these games, which is never a bad thing, they were all pretty much similar to any of the other beat-'em-ups available at the time, albeit with plenty of platform-jumping tasks thrown in. What made them enjoyable, however, were the areas full of platforms and hazards that really put your reflexes to the test, as well as bosses that were ugly, intimidating, and full of different attack patterns. Imagine if all those challenging gameplay situations and clever bosses were missing, though. 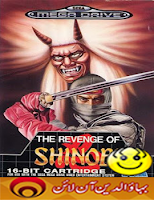 That's what you get with Revenge of Shinobi for the Game Boy Advance, a brand-new game that shares its title with the second installment in the series, but doesn't possess anywhere near the level of polish or charm of its Genesis namesake. Slash the enemy, the beehive, and the pot and move to the right. Repeat. Unfortunately, all these actions are meaningless for two reasons. First, there are precious few moments when you'll actually need to use any of your abilities to bypass an obstacle or navigate a tricky environment. Unlike in a game such as Castlevania, in which you need to discover the best route through a stage and then figure out the proper timing for jumps and switches, there aren't any specific routes or puzzles in Revenge of Shinobi. As long as you move cautiously to the right, you'll be able to see and avoid most hazards. There are few times when you need to climb upward or backtrack--so few, in fact, that every level feels like a journey from left to right. The second problem is that while you have a number of different abilities, you're always using them to shatter item boxes or trigger switches that unlock the route to the next area. You can use magic or hurl throwing stars to open boxes and trigger switches, but there aren't that many situations that actually require you to do so. At the same time, the enemies you'll face aren't really susceptible to any particular type of attack, and they don't exhibit any sort of intelligent combat behavior. They'll stand at a distance and swing a chain at you, and sometimes they'll jump into the air, but mostly they'll do nothing to avoid your attacks. The game is painfully repetitive, and the only breaks in the monotony are the frequent occasions when a tree branch suddenly falls on you or a samurai pops out of a thicket. However, these sequences are repeated so often that you learn to recognize the visual cues and avoid them without fail. It's unfortunate that Revenge of Shinobi is so dull to play, because it does a nice job of capturing the look and feel of previous Shinobi games. The backgrounds resemble the pastoral gardens and hills of feudal Japan, and there are plenty of examples of artistic detail, such as flittering butterflies and tranquil streams. Every level in each of the five main settings constantly recycles objects from previous stages, which is distracting, although not terribly so. 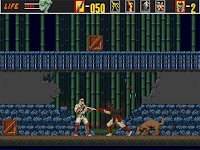 Even though the character sprites for basic enemies are limited to four or five color shades, Shinobi and his enemies feature a relatively wide variety of animations and move without choppiness. The female ninja stands there as Shinobi chucks a throwing star at her face.